25 years ago today I gave birth by Caesarean to my second child . A boisterous boy to compliment my daughter who had been waiting to become a big sister for over 5 years . I was so excited about going into labour as I was now a midwife – I “knew” what to do – I felt positive and excited . Off I went on my merry way . Fast forward to my term appointment with my midwife (I had started to have a few niggles but I was determined not to rush into hospital and previous complications meant a home-birth wasn’t an option) . My midwife confirmed my concerns – the baby is breech and there’s nothing in the pelvis at all . I was sent to the hospital – I felt annoyed with myself . About 5 hours later I was in theatre having a spinal in preparation for a Caesarean. In those days the false evidence of the vaginal breech trial was forced upon many women – I was frightened into having a Caesarean – I truly felt robbed . I took it all on the chin and decided that it as a midwife would be an asset to have experience of normal birth and Caesarean. This personal experience of mine would help women to know that I’d understand and support them through any birth . At my Caesarean my son was born – I saw him for less than a few seconds and he was whisked out of theatre into an ante room . There he was wiped down, rubbed, touched and handled by midwives. Then my son was measured,weighed, given vitamin k dressed and wrapped up . I didn’t hold him for 4 hours and I wish I’d been able to. Not having skin to skin contact in the Operating theatre hasn’t affected the relationship I have with my son . I did however long to hold him whilst I was in theatre and kept asking where he was and when I could see him. Not having skin to skin contact has made me determined to educate women and those who attend birth in the operating theatre as to why skin to skin it’s so utterly important- it’s a physiological norm for human mammals . Each time I’m with a woman in the operating theatre I don’t feel angry or upset about my experiences- I just feel very thankful and grateful that times are changing and that skin to skin is becoming normal in the theatre environment. Skin to skin was never mentioned to me at all for my son’s birth – God forbid a woman would want to hold her baby whilst being operated on in the 1990s !! Well thank goodness times have changed and that there are lots of brilliant midwives, theatre nurses , obstetricians, anaesthetists and operating department practitioners who know why skin to skin matters . In helping families they are changing the system. They realise that birth in the Operating theatre isn’t about “their theatre” functioning in the same way it always had done but about making the Operating theatre a “family space” . Once I got to the ward a dear colleague of mine (who has since retired) came to see me and asked me if I’d had skin to skin contact. I hadn’t even fed my son yet!! – luckily my son was a sturdy 8 pounder . My lovely friend passed my son to me so that I could take his sleep suit off , explore his skin , check his fingers and toes , gaze into his face and start our journey as mother and son . He was soon breastfeeding and I felt relieved that my friend had supported me . 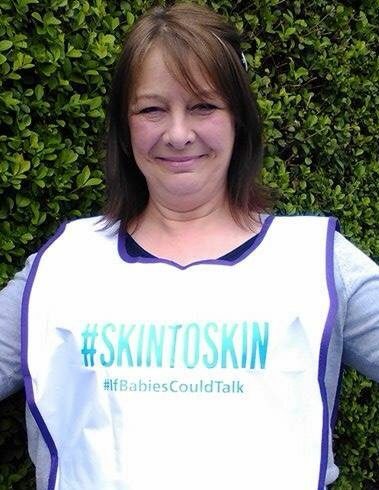 If you are wondering whether I’d be such a protagonist for skin to skin if my second birth had been different? I know I would be !! The infamous Dr Nils Bergman set off my interest in why skin to skin matters for all newborns and he instilled in me a duty to spread the word. I am really proud to have helped many women to overcome their doubts and fears about skin to skin in the operating theatre and I hope I continue this journey with many more families. This blog is dedicated to my son and daughter who have made me the mother who I am .